As spring bear season approaches, outfitters in Alaska and the Pacific Northwest are gearing up for another year of tracking North America’s largest land predator. For many hunters, taking down a grizzly bear or even a black bear can be the hunt of a lifetime. 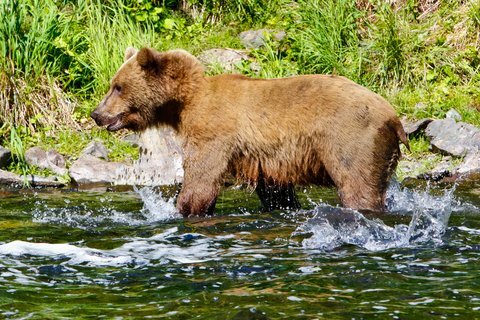 From the full-on Alaska grizzly bear experience, the elusive black bears of Southern Oregon to the untouched wilds of Montana, we’ve got you covered on some fantastic options. There’s no place in North America more notorious for grizzly bears than the Alaska Peninsula. At Alaska Perimeter Expeditions, master guide and outfitter Henry Tiffany explains on his web site he doesn’t believe the quality of a hunt should be measured in inches. “Instead, it should be measured by the overall experience, adventure and true hunt for the oldest, largest animal that can be found,” Tiffany writes. Down in the lower 48, the wilds of Northwest Montana offer unparalleled beauty and opportunities for hunting big beasts. Swan Mountain Outfitters are getting ready for Spring bear hunting season throughout the month of May. Every hunt, whether its bear, elk or bighorn sheep, are conducted by way of horseback, offering a unique experience in big sky country. A little further south in Wyoming, the guides at Hoback Peak Outfitters say the chances of bagging a bear are great. Bear season here runs May through June. Hunting is done through bait stands with ground or tree blinds in numerous drainages throughout the area. Such a great time to be in Wyoming and the bears are on the move. In the Western mountains of Oregon, spring bear hunting season runs April through May. But these can be elusive animals to find. If you’re hunting on your own, the Oregon Department of Fish and Wildlife advises to look for clear-cuts, meadows and open slopes that have cleared of snow. Earlier in the season, focus on south-facing slopes with rapid spring growth and open canyon slopes where bears can be seen feeding on grass and digging roots. Remember it is unlawful to take cubs less than one year old or sows with cubs less than one year old.